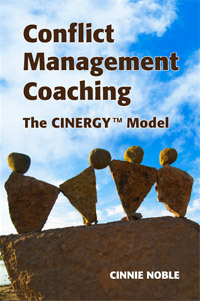 Conflict Management Coaching: The CINERGY Model is a comprehensive and dynamic book about coaching people on a one-on-one basis, to improve their skills for managing and engaging in their interpersonal disputes. The text not only describes the research-based coaching model that uniquely combines conflict management, coaching and neuroscience principles. It also shares many forms and ideas that support a coaching practice. Conflict Management Coaching is aimed at coaches, mediators and other conflict management practitioners, HR professionals, leaders, lawyers, psychologists, social workers and others who work with people in conflict. Members of the Association for Conflict Resolution may purchase the book through The ACR Amazon Connection. “Cinnie’s book is at the crest of the third wave of coaching publications, one that brings a new level of maturity to the profession. Her background and experience meet the increased need for pertinent information, approaches and understanding for coaching clients in specialty areas and, in this case, for coaching clients through conflict. Any coach can take away valuable learning from Cinnie’s breadth of knowledge and clarity of expression. – Ralph H. Kilmann, Ph.D.